Somehow this Cab “event” just happened over the last week. Originally I was going to write about these in separate posts but realized, as the empty bottles kept staring at me on my desk, that not only had we drank two Cabernet Sauvignon’s back to back [not on same day] but they were both from California’s Sonoma County. Although I did buy both at a grocery store [Winn-Dixie] and because I realize many if not most grocers do not sell $20.00-$30.00 bottles of wine I have decided not to classify them as such for this post. As usually happens lately I was attracted to both wines because of their pricing. Not their retail price which runs from close to $20.00 for the Rodney Strong and $28.00 for the Kendall Jackson but their SALE prices. When I have the opportunity to drink $30.00 bottles of wine @ close to 50% off you bet they get my attention. Heck it actually makes my mouth water if I am being honest. Now if only I could find some $70.00+ wines on sale 75% off… I can dream can’t I? 2008 Kendall Jackson Grand Reserve Dark purple almost black in color. On the nose; a very rich overall aroma, very appealing. Noted; vanilla, cedar, tobacco, spices as it opened with berry [casis] coming through. Minerality [clay soil? ], leather and mocha were also detected as the wine opened. Tasting added dark fruit [plum, fig] along with black pepper. 2009 Rodney Strong Purple dark garnet in color. Aroma; abundant. Interestingly this wine was thought to be a Zinfandel upon decanting by a fellow drinker. On the nose we detected; caramel/molasses, wood [cedar], vanilla, tobacco, pepper, dark fruit [currant], and raisins [dried fruit]. Tasting added an earthy minerality, mushrooms, anise, chocolate with a lingering finish and the wine becoming more tannic as it opened instead of the usual reverse. I would better describe it as a long tannic finish. Rating tidbits found: Wine Enthusiast rates the Rodney Strong at 87 and the KJ at 90 points. Wine Spectator and their vintage chart rates the 2008 Sonoma vintage at 86 with a Hold suggestion for drinkability and the 2009 vintage although not finalized is estimated to be in the 83-86 range. I found this information after drinking the wines, I do enjoy researching my wines but prefer to not look too deeply into the ratings until I have my say 🙂 The WS vintage chart ratings seem a bit low to me but that could just be due to the saturation of the market with marketing campaigns quoting 90 POINTS! or higher from all types of sources out there. That said, if any organization out there wants to quote my rating on a wine you know how to reach me LOL. My opinion on these two wines is close to the Wine Enthusiast rating. The Kendall Jackson Grand Reserve was bold and consistent throughout the evening, delicious. Something interesting happened with the Rodney Strong. It was incredible out of the bottle and by itself but as soon as we paired it with food [camembert & goat cheese to start with mushroom pesto pizza later] the flavor of the wine deadened. At first I blamed the pairing but interestingly enough about 1-1.5 hours after decanting the flavor of the wine came back close to its original intensity. I had never experienced flavors fading and then returning as the wine breathed. I should also point out that the KJ being a 2008 may have a maturity advantage over the Rodney Strong. I have to say I enjoyed both wines. In a blind tasting I probably would have picked the Kendall Jackson but who knows; the Rodney Strong was delicious straight out of the bottle too. Would I buy these again? Yes! But hopefully at great SALE prices. ¡SALUD! This Cabernet has distinct flavors of blackberry, blueberry, black currant and cassis with enticing fragrances of mocha and nutmeg. Subtle notes of smoke, cedar and tobacco leaf round out the lingering finish. Grand Reserve is a winemaker’s blend of our mountain, ridge, hillside and benchland grapes grown along California’s cool coastal appellations. We hand select grapes from our best estate vineyards and then monitor, taste and hand-hold each individual lot throughout the winemaking process. Each lot is kept separate, barrel-aged and handcrafted – boutique winery style. Our winemakers have an unmatched palate of flavors, toast levels and terroir nuances from which they masterfully blend these exemplary rich, deep and complex wines. Aromas of blackberry, cocoa, and currant lead to a rich, layered mouthfeel, replete with black cherry, cedar, and cassis, and structured with lush, mature tannins. Enjoy this seductive Cabernet Sauvignon now and over the next several years. We came to discover this beautiful wine at a recent Pacific Northwest Total Wine and More class. It turned out to be one of the few highlights from this class. Not because of the wine choices but unfortunately due to an unorganized substitute instructor. In fact this was one of my favorite classes last year. I quickly remembered the difference a good teacher can make on their students. Luckily we had wines like this to make up for it and the realization of how very lucky we are to have a real pro usually at the helm. I was surprised to learn that Washington State is located at the same latitude with the Bordeaux and Burgundy regions and that Washington State’s growing region is actually a dessert with irrigation required. With great value wines coming from this area; Merlot, Syrah and Cabernet Sauvignon varietals have really taken off due in part to Washington’s volcanic soil. 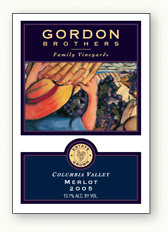 Gordon Brothers Family Vineyards are a boutique producer of hand crafted wines. Family owned and operated, estate grown and produced. This powerful Merlot vintage, aged in small american and french barrels, has been rated by Wine Enthusiast magazine at 91 points. Deep dark ruby in color, full-bodied, with rich aromas of spice, black cherry and even flower petals, may be considered medium bodied by most but I say it is more full-bodied with a great long finish. I believe this to be due to the wine maturing since 2007. The medium body may have existed a few years ago but its newfound richness is all present day. Great…., just what I needed; an excuse to open my last bottle in the wine cellar [better known as the guest room] or go out and buy some more before they sell out! This wine has made me a Merlot fan, SALUD!